Have you ever wondered when it’s time to quit your nursing job and move on? Are you stuck in a job, uncertain where to go next as a nurse? Or do you just need a change of scenery? It’s all about timing, self-care, finances, lifestyle and workstyle, career development, and other factors that impact how long you stay and when (and why) you go. Ready to Move On or Not? Making the choice to move on from a nursing job you’ve had for a while is not always an easy choice. There are multiple reasons to move on, just as there may be a myriad of reasons to hang in there. What has led you to quit jobs in the past? Was it money? Was it health insurance or other benefits? Were you mistreated, overworked, burned out, or underpaid? Did you receive an offer you simply couldn’t pass up? Did you need to relocate? Were there other reasons you left for greener pastures? Sometimes we feel we should move on but something stands in our way. Is it the money or the benefits? Is it pressure from our spouse or family to not undergo the stress of a job change? Or is it just regular old lack of motivation and career lethargy? Whether you currently need to move on or not, it’s always good to be prepared for the eventuality that a change may be on the horizon. How many reasons are there to quit your nursing job? Let me count the ways. Poor leadership/management: One of the top reasons that people leave jobs is poor management and leadership. When you don’t feel supported by those who you report you, the game’s over and it’s time to jump ship. Your nursing license is endangered: If your work environment is such that you feel that your nursing license is at risk, leave that job today and don’t look back. No amount of money or benefits or prestige is worth the risk of losing the license that you’ve worked so hard to earn and maintain. An untold number of circumstances or conditions can endanger your license, patient care, and perhaps even your safety. My advice: don’t compromise on this ever! It’s just not worth it. You are physically unsafe: An unsafe environment where you’re physically in danger and have little or no protection is a workplace that simply doesn’t deserve you. If your workplace doesn’t offer the resources to be physically safe from harm, grab your parachute and leap from the plane before you experience unnecessary and wholly preventable injury. Mistreatment/bullying/harassment/etc: Mistreatment and aberrant behavior thrive in nursing and healthcare for some reason. Bullying is rampant, and discrimination and harassment are common. The presence of such behavior, when it goes uncorrected, is a sure sign that you need to exit, stage left as soon as possible. In the presence of persistent on-the-job bullying or harassment, I generally advise clients to leave their job immediately since that type of toxic environment eats away at the soul and psyche in very unhealthy ways that can be more damaging than being unemployed for a period of time between jobs. Bullying can cause you to make errors and lose confidence, and no one needs that kind of energy running in their work lives. Overwork/staffing issues/burnout/unhealthy environment: This is so common it’s almost laughable if it wasn’t so tragic. California is the only state in the U.S. with mandated nurse-patient ratios, although some other states are moving in that direction. Legislation to mandate safe ratios nationwide makes its way through Congress every year but has yet to come down for a vote. 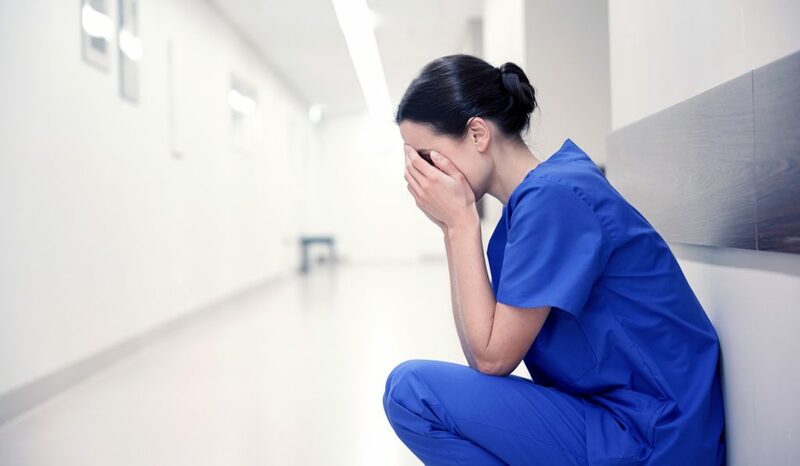 Burnout often results from overwork, the pressures of mandatory overtime, long hours, high ratios, and unsafe staffing that can result in nurse or patient injury, medication errors, and many other less than positive outcomes. Pay and benefits: With the cost of living as it is in the 21st century, it’s understandable that some nurses choose to leave their jobs in pursuit of more pay or improved benefits. Health insurance and your personal healthcare can be expensive, and some employers offer much more robust health benefits that others. Healthcare and childcare savings accounts help employees shelter more of their money from taxation, and other benefits like time off and money for continuing education can be attractive. A better opportunity: Sometimes we leave jobs because something better came along. You never know when a new opportunity may cross your path, so be ready to jump when the jumping is good. New opportunities can lead to more responsibility, new clinical skills, a shot at a new circumstance that lends itself to career-building, or a host of other potential positive outcomes. Relocation: Moving to a new home in a new town, city, or country is a common reason to leave your job. Relocation is common, and sometimes we just have to move for a variety of reasons, even if we’re happy in our work. Give ample notice: I always recommend telling your boss that you’re leaving before you tell your colleagues (unless you have a peer in whom you’ve been confiding your plans). In terms of avoiding the unnecessary burning of professional bridges, try to give at least 2 weeks’ notice. However, it’s my humble opinion that giving notice isn’t totally necessary for a variety of reasons. For example, if you’ve documented bullying and reported it to your supervisors or managers, you deserve to leave stat if they’re consistently unresponsive. When you first report the situation, consider telling them that you’ll need to leave forthwith if the situation isn’t addressed appropriately and quickly. If you report it more than once and nothing happens, you’re in your rights to get out of there. Request an exit interview: Exit interviews happen routinely in many industries, but I don’t really hear about them much in the healthcare setting. When preparing to leave, request an exit interview where you can give your employer or your supervisors feedback. If no exit interview is granted, put it all in writing, keep a copy for your records, and distribute it to as many key players as you like (e.g. : CEO, CFO, CNO, nursing director, charge nurse, supervisor, etc). Connect with colleagues: A big order of business is connecting with friendly and supportive colleagues on LinkedIn throughout your career. It’s advisable to keep in touch with colleagues and peers over time for a variety of reasons, and LinkedIn is a great way to organize them all in one place. If you’re planning to quit or resign, begin connecting with your colleagues who you like and respect the most. Your ongoing job will be staying connected with those peers with whom you have the most positive rapport — you may need each other in the future. A nice gift to your best colleagues is to write them a recommendation on LinkedIn, which may be reciprocated. You can even ask to exchange recommendations with those with whom you share mutual respect and admiration. You can also ask certain individuals to serve as references in the future. Offer to train your replacement: If you’re in a position with unique responsibilities, offer to train your replacement (if it’s at all possible). Sometimes we’re the holders of important knowledge or skill that needs to be passed on to the next person when appropriate. Be self-contained: When you’ve decided to leave, play your cards close to your chest and don’t blurt it out everywhere at once. Be sensitive to your colleagues who may want to leave but can’t yet do it — they may be envious of your escape plan. Be empathic with those you’re leaving behind, especially if it’s a toxic or difficult work environment. Share the news of your leaving quietly and gracefully. Document: If you wrote articles, co-authored studies, took part in committees, or otherwise got involved at work, save copies of anything you were a part of (unless, of course, it’s protected proprietary information that can’t legally leave the workplace). Pat yourself on the back: You deserve it. Period. As you can see, there are plenty of things to do in order to move forward into a brighter future. Once you decide to leave, update your resume and LinkedIn profile with your new data. (If you’ve been following my advice all along, the job you’re leaving has been on your resume and LinkedIn profile since you first started that gig.) If you’re starting a new position right away, add it now. If you’re leaving without the safety net of another job, you may have some budgeting to do. If you have a spouse or partner, make some plans — if you’re single, you’ll have to be even more diligent in terms of managing a period of unemployment on your own. Once you start a new gig, begin forming relationships with fellow colleagues, connect on LinkedIn, and otherwise set the table for success. When interviewing for your next position, you’ll most likely need to explain why you’re planning to leave your current job or why you already left. Have your authentic story ready — every circumstance is different, so there are no cookie cutter answers here. If you need help in such an important transition, make use of a career coach, mentor, trusted colleague, or counselor. It can be a lonely and stressful time, so ask for support from whomever would be most effective at being present for you when you need it the most. Leaving a job is a potentially stressful time, especially if you don’t have anything else lined up quite yet. Be thoughtful, circumspect, kind, strategic, organized, and gentle with yourself, and things will fall in place as you do your due diligence and move forward into an even more promising future.